Once in a while a reviewer of children’s books likes to sit down and reassess their occupation. Here I am. I am an adult and I review books for kids. And most of the time I really enjoy it. I just have a fabulous time reading all these children’s books and then spouting off opinions about why you should or shouldn’t hand 'em off to the youngsters. But in the end I am still an adult and my opinion is that of someone over the age of 25. A lot of people in my position have a hard time separating their adult perspective from their knowledge of what kids like. Am I blabbering on here? Well, there’s a reason for it. Nine times out of ten, when I read a children’s book that mucks with my mind, I don’t review it. Simple as that. I think, “Book hard. Me no review. Me watch Colbert Report instead,” and that is that. 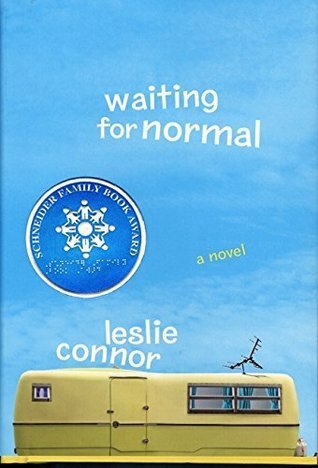 But I felt compelled to push through my natural malaise to review Waiting for Normal by Leslie Connor. This is partly because the book has been garnering pretty much universally stellar reviews. The writing is strong, the characters interesting, and the plot tight. My problem? The audacity of hope, I guess. This book is awash in it. And so, I must pry my snide, callous, New York City sardonic self away from myself as a 12-year-old child and let these two components of my reviewer self duke it out. Say what you will about Addie, she doesn’t let a little thing like the complete and total dissolution of her family unit get her down. Addie’s mom (or Mommers) and Addie’s wonderful stepfather Dwight have just gotten divorced, and he is legally responsible for their children. Addie, on the other hand, is biologically just her mom’s kid so she’s left to live with Mommers in a trailer in the middle of Schenectady that Dwight has provided. Addie’s always had a way of dealing with her mom’s inconsistencies all her life, and now isn’t any different. With Mommers disappearing for days at a time, Addie concentrates on the things she can control. Her flute playing, her hamster Piccolo, her friends at the corner convenience store, and getting to see her half-sisters and Dwight whenever she can. Yet as her sisters’ lives get increasingly better without her, Addie’s own world becomes more and more unstable. Strength of character is her best friend now and her eventual freedom will have to rely on danger. What I’m trying to figure out is why I originally resisted this title. I think it may have something to do with the language that’s surrounding the book. Phrases like, “one girl’s giant spirit” and “will touch readers’ hearts.” Ew. We live in a society where real honest emotion is far harder to find than crass commercialized Hallmark moments. Plus I read so many books that try to take advantage of a reader’s feeling by shamelessly tugging at the heartstrings like they were marionette lines. Do that once too often and the strings get lank and loose. Then Waiting for Normal comes by and it isn’t flashy at all. It’s packaging keeps pronouncing in big shiny letters, “A heartwarming gem”, and the like, and badda bing, you’re jaded before you’ve even read a page. What I would have preferred would have been to have received this book as a coverless, blurbless manuscript. Just black words on white paper, because the power of Connor’s writing doesn’t lie in promising you a rollercoaster journey of the soul. She’s a good writer precisely because she is understated. Look at her other books. This is the woman who wrote the brave picture book tale, Miss Bridie Chose a Shovel. If you haven’t read that book then you have a gap in your library. Fill that gap. In that story Connor’s words are honed down to their pure essential core, telling a story without fluffy details and ridiculous razzmatazz. And the same feeling shows up in this book, but in a different way. Here, Connor’s voice as Addie is what holds everything together. Addie’s not laugh-out-loud funny but she is wry, self-deprecating, and the kind of person a kid would want to spend a whole book with. Come for the tone, stay for the writing. There was one other obstacle to overcome before I declared the book a winner. It has what can only be described as the most hope-ridden child since Pollyanna herself. A 21st Century Pollyanna for the masses, that’s what Addie is. But there’s a difference between being hopeful and being blind or ignorant to the world’s injustices. Addie has faith in a way that, somehow, is never annoying. Do you have any idea how hard that must be to write? And what’s more, when the obligatory “our heroine loses hope” scene comes up, it’s its own beast. Some kids would stop eating, going to school, or seeing their friends. Addie returns a flute, and somehow that carries more weight. I mean, she’s still a pretty unbelievably well adjusted kid, for all that’s happened to her in her life. For example, when she finds out that her beloved step-dad is getting married to a wonderful woman and that he and her half-siblings are going to be cheery, merry, and gay with this person, does she dislike the interloper or resent Dwight telling her this news? No, instead she punches his arm lightly and says, “Thanks for telling me everything,” which is verging on the disbelievable. If you can overcome your skepticism when this kind of thing happens, you’ll have an easier time reading the book. Was some of it predictable? Of course! Because (and this is what I, for some reason, have to keep reminding myself here) this is a children’s book and if you read a certain amount of them then elements are going to crop up more than once. Addie’s mother kept reminding me of negligent mom or pop characters in other books, but she certainly had a manic depressive style of her own. And none of this is to say that I wasn’t delighted to see some of my jaded assumptions just go higgledy-piggledy out the window. The rule in children’s literary drama is that if the child with a bad housing situation receives a cute fluffy animal (say, a guinea pig) in Act One, then that same fluffy animal is going to die sometime in the next fifty pages. I call this the Chinese Cinderella rule. A rule that Connor wasn’t afraid to use to ratchet up the tension without actually pulling the trigger. I would recommend reading the first chapter of this book (it’s only five pages) in a children’s literary course or a class on how to write for children as an example of showing, not telling. Our slow realization that Addie’s mother is selfish and self-centered isn’t crystal clear from page one. All the same, you’re getting hints of it. It’s like when you meet someone on the street and as the conversation continues you get that slow dawning sense that the person across from you is one Brady short of a Bunch. That’s what Ms. Connor does. She draws you into her characters so that your faith in them is reliant on where a scene goes from one moment to the next. Now I began this review by mentioning that an adult reviewer who talks about a book for kids should always remember that the intended audience is (shockingly) not twenty-nine-year-old librarians. So here’s the million-dollar question: Are kids going to like this book? And the answer is: Darn tooting. Darn tooting they will, because if nothing else Waiting for Normal is infinitely readable. Here’s why I think the book is going to work for the kiddies. It’s clocking in at 304 pages, but it reads zippy quick. I didn’t feel a lull or a gap in action at any point. The drama is focused pretty squarely on the family situation, which means we don’t have to have the rote scene where the best friend at school suddenly befriends the popular snob. Also, my library often hosts a pack of sixth grade girls who only want one thing: realistic girl books. Finding titles for the tween set is always difficult because you don’t want to hand them stuff that’s too mature and you don’t want babyish fare either. Waiting for Normal is going to be perfect for all parties involved, and I cannot wait to get it into their hands. All right, I give in. It’s a good book. Maybe even a great one, though I think it would take a rereading or two to know for sure. Kids will dig it, adults obviously do already, and as a reader I’d just like to say that if you or your kids aren’t into “heartwarming” tales, I think you’ll still enjoy this book. It’s definitely been bitten by the honesty bug. A title that deserves attention. Sign into Goodreads to see if any of your friends have read Waiting for Normal. I read this book quite a while ago and the main character has stayed with me. I liked her resilience and her final understanding about her mother's failings---not in a sense of rejection, just in a sense of maturing. The book seemed very honest in terms of portraying her emotions. Yep, I'm trying to decide how I feel about it. On the one hand it didn't surprise me, but on the other hand the writing was good and the main character a kind of 21st Century Polyanna. Dunno. I'll have to bounce this one off of my co-workers, I think, before I review it. I really enjoyed Waiting for Normal. I look forward to your reviews as always! Thanks! Hey, do you need a copy of Gail Carson Levine's "Ever"? Cause I have an extra copy I don't need. Just shoot me an e-mail if you want it. Oh, no, but thanks so much for the offer! It means a lot to me.I'm getting a copy from Harper First Look, but it just hasn't come yet. Well, this showed up as the first review of Waiting for Normal when I posted mine - which included a link to the SLJ review, encouraging people to go read it as it was great. (Even if there were a few small points about which I disagreed with you!) It's a tough book to write about, but I love what you said about the 'audacity of hope'. I tell you what I loved so much about this book... Connor gets it. "It" being the lives so many of my students are living everyday. And although many of them aren't resilient, you would be surprised how many are. So many kids could relate to this book, well probably girls, but so many. And there were several times in the story I thought, this chick had to be a teacher at some point because some of the school related stuff is DEAD ON. And THIS is why it rang for me, a fifth grade teacher. Well, you all have me intrigued and thanks for the different perspectives of teacher, adult, and librarian. Sixth grade girls do gobble up realistic fiction and it is nice to have something to recommend that doesn't involve the word "clique". Sometimes we need a slightly unrealistic character capable of so much more than our own flawed selves so that we hope and aspire- and, yes, I agree with Megan, kids are often a lot more resilient than we would give them credit for. Good point. I used to get a huge group of girls from the Performing Arts School here in NYC that were desperate for anything tween and girly. I tell you, my brain ran out of ideas much faster than I thought it would. This book will make for great booktalks. got recommended this book any good? Ok thanks I'll read it! Is this a children's book?